I fly to Alice Springs this morning to do my training walking-writing workshop with Jan and Into The Blue, so things will be quiet around here for the next week, although I hope to blog from Darwin next week. In the meantime, Locus comes out with Gary Wolfe's review, and when that happens the Australian cover for Tender Morsels is unembargoed (because it quotes the review), both of which I'm very excited about and frustrated that I can't show you. I promise, as soon as I get back to this laptop, you shall see the gorgeous creation that awaits Australian readers. I can't quite believe this, but the US Junior Library Guild has licensed Tender Morsels. My publisher says, 'JLG is like a book club for libraries—a selection service, really, for their kids and YA collections. So I’m always pleased when they adopt a book—it’s like the library seal of approval'. D'oh, we'll never get the book banned and controversial at this rate. The prize is Margo Lanagan's 'The Fifth Star in the Southern Cross'. Uncharacteristically for Lanagan, this is set in an unambiguously science-fictional future in which human fertility is in ruins (we assume as a result of environmental damage). We witness the protagonist's encounter with an apparently genetically-engineered prostitute [read: alien], then a meeting with a woman he had a one night stand with, which surprisingly has resulted in a viable pregnancy. It's bitter but not mean, the characters damaged but not evil. Powerful stuff. 'On the whole the book is pretty strong,' he reckons, 'particularly in the latter half, which features some brilliant work'. What with Isobelle Carmody's 'very fine strange dream story', a few writers achieving 'real weirdness of affect' and John Birmingham's entertaining time-travel-zombie-Aus-history mash, you'll want to get ahold of this one, I think. 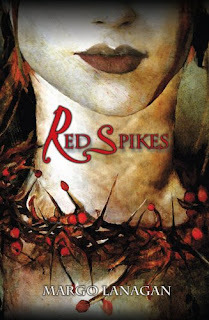 Red Spikes gets one for Best Book To Never, Ever, Ever Read At Bedtime. The excellent Robin Boustead of Trek & Travel has equipped me with these top (sorry, that should be taupe—and stone blue) boots. They're comfortable, supportive, and waterproof so that they'll also do for the Tarkine in January. Will let you know how I go on West MacDonnell rocky bits. The boots are called Chameleons, so there may be times when it's difficult to find my feet, haw, haw. Robin also sold me two pairs of the very latest in women's endurance sock technology, Irish Bridgedale Trail Lights: 42% Nylon/polyamide, 38% New Wool, 19% Endurofil (TM)/polypropylene and 1 % Lycra(R)/elastane. If I lose one of these babies in the outback, it will be making good hopping-mice nests for about 10,000 years, I should think. Eckersley's art supply shop sold me a noice set of 24 pastels that looks to have the requisite number of ochres for the job. Now, what book should I take? And then, an even more crucial decision: which notebook? I have a large pile of possibilities there. Many hours of pleasant dithering and notebook-fondling ahead. 'The Goosle' is still making me friends. Margo Lanagan's "The Goosle" is both a reimagining of and a sequel to the story of Hansel and Gretel. 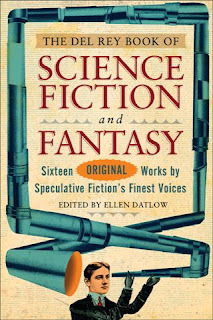 Dark, frightening and wildly creative, it's my favorite story in the anthology. She's another writer I really need to read more of. I think so, Nick. Especially when her novel comes out. Roll on, October! Shake in your boots, ye critics. “The Goosle” by Margo Lanagan is a disturbing followup to the classic tale of Hansel and Gretel. To be honest, I’m a wee bit nervous to be reviewing her piece. I’ve seen her reactions to other reviews, reviews that I thought were fairly glowing and well-meant, and she comes across as very unsatisfied. Either way, “The Goosle” has a lot of creepy things in it: acts of cannibalism, sexual slavery, dirt for lunch, witchcraft, and abuse galore. It’s told from the perspective of a young boy, which makes everything happening more intense, and the outcome completely surprised me. It was great, viscous and unrelenting to the end, with strong images like the mudwife’s house and the stars in the sky. The story is still quite clear in my mind. Truth be told, it was the first one I read when I got the book. Hm, I'm surprised he found it viscous—I thought it flowed along at quite a clip. Snrch. Apart from that, there's nothing to be unsatisfied with in that review...so what's a cranky ould witch to do with herself? ...copies turned up today from David Fickling Books, and very purty it is too. The jacket uses the same lovely image as the US edition, but the case is black, rather than green with a red spine. The Amazon page says the publication date was 5 June, in which case, I dare say London is still in lockdown as my eager UK public beat a path to the bookshop doors. Pardon? Why, yes, it has been something of a long day. I should point out to all charities and tax officers out there that I'm emphatically not taking part in the first of those activities, unless you count the numbers after the decimal point. Margo Lanagan's horrific and disturbing "The Goosle" is a sequel to the fairy tale of Hansel and Gretel in which a mentally handicapped Hansel returns to the mudwife's castle in the company of a con artist who regularly takes sexual advantage of the ignorant Hansel. Mentally handicapped? This is a boy who's taught himself to navigate by the stars, a very thoughtful boy with a strong sense of justice and an instince to act on it at the first opportunity. His only handicap has been his own youth, innocence and physical powerlessness; oh, and the fact that his family cast him out might have set him back a bit, too. But mentally handicapped? Sam, you are just wrong. And yes, I know, authors shouldn't respond to reviews. But, really.